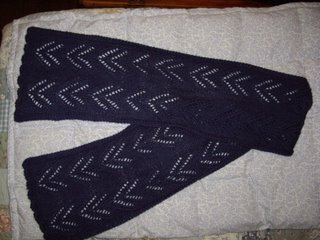 Joni received the scarf that I made for her, so now I can post a picture of the finished product! This was a great project for me. I learned two new techniques in the process: (1) short rows, and (2) fringe (OK, not hard, but it was a first for me). I love the Silk Garden yarn. I did mess up a bit while binding off, so I hope the fringe camouflages that. 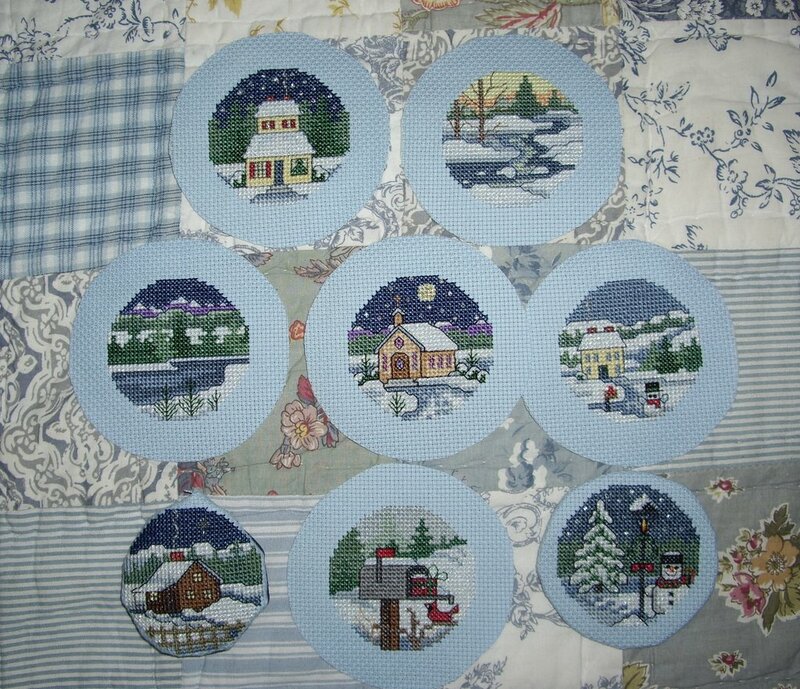 I love stitching little ornament projects. 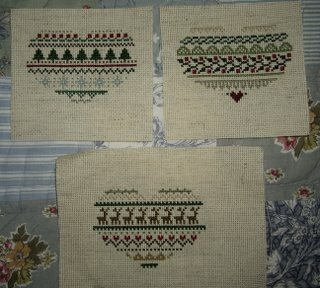 The problem is that I only enjoy the stitching, not the finishing. Over the years this tendency has resulted in a boatload of little, tiny, unfinished WIPs. Last time I visited my parents my mother cleared all of these projects out of storage and told me to take them away. So what did I do? I joined a couple holiday ornament swaps, hoping that this will provide me with the long-overdue impetus to finish these babies off. Exhibit B: Cute and cheery bird and Santas. Exhibit C: Old-fashioned hearts. These are going to be awful to finish off because of their odd shape. since I clearly exist, and I just don't think my name is that unusual. Silly quizzes. I had to explain to my friend Bryan the other night what blondies are. He had never heard of them! Shocking, I tell you. - Polenta Lasagna. I add sun-dried tomatoes, Tabasco sauce, and cayenne pepper. - Leek and Goat Cheese Focaccia, from Jeanne Lemlin's Main Course Vegetarian Pleasures, a favorite cookbook (in spite of its awful title). - Black-Bean Quesadillas with Goat Cheese. Once again, I add plenty of cayenne pepper! Midwest knitters, take note! This is right outside Madison, in Mt. Horeb, WI, and it would combine quite nicely with the EZ exhibit in Madison. My International Scarf Exchange package arrived in the mail this morning, and I absolutely adore my new scarf! 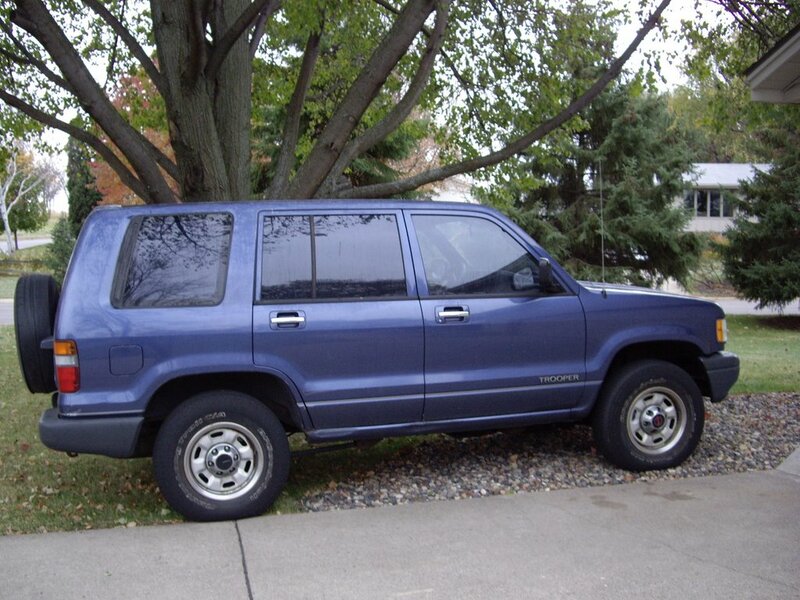 It's a beautiful dark blue, and it looks great with my blue and grey coat. The yarn is Debbie Bliss Alpaca Silk, and it is divinely soft. 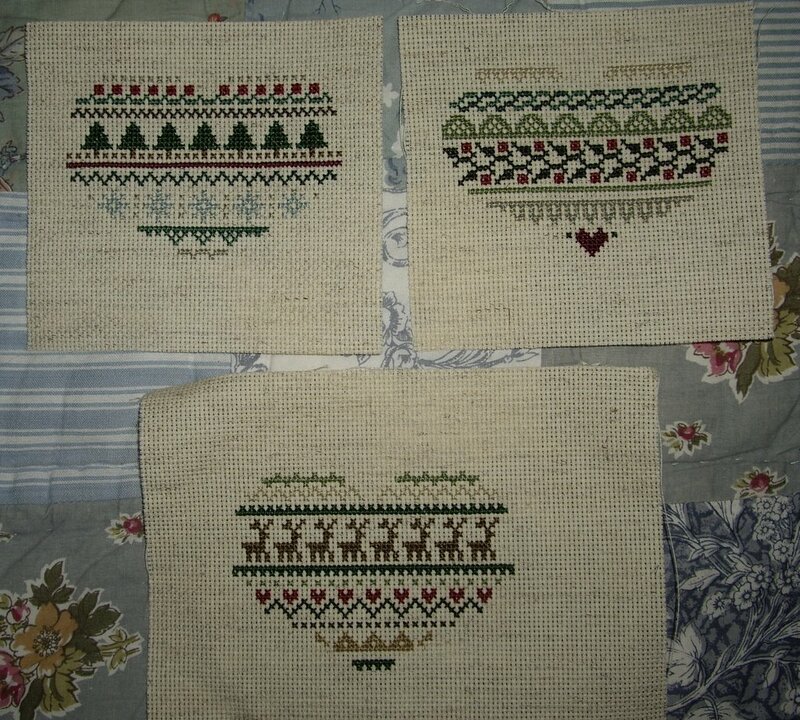 The stitch pattern is beautiful. My pal, Joan, did such an excellent job on this! I have already worn it, and my best friend noticed it right away when we met for lunch. Joan included other goodies as well: Cast-On magazine, fancy chocolate-covered Oreos, some yummy-smelling Savannah Bee Company honey hand lotion, a neat flower lollipop, and a skein of some beautiful and unusual yarn. Mango Moon Bali Sky, in 3302 Dawn. So gorgeous! I think it's made from recycled sarongs. It deserves a very special project! 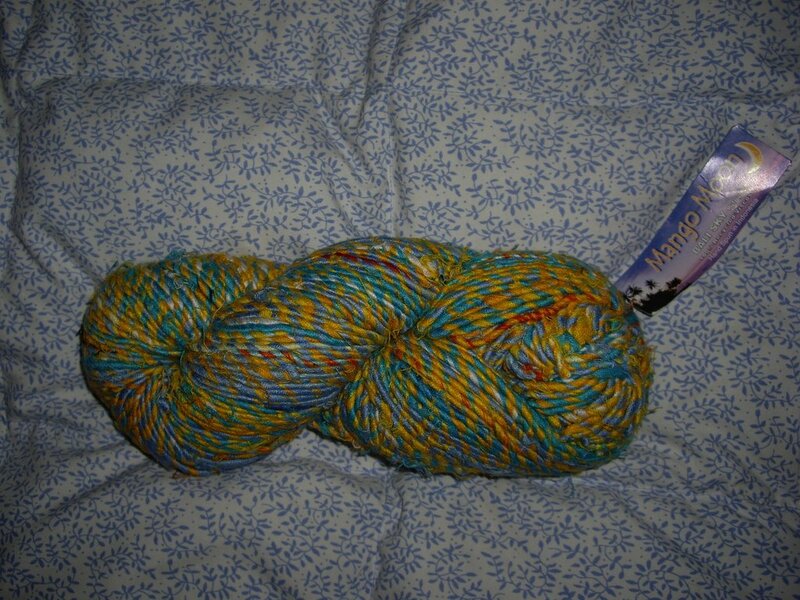 Joan carries this yarn in her online yarn shop, The Local Needle. Very, very odd. This is the type of sign that doesn't get posted unless there's a history of such activities taking place. 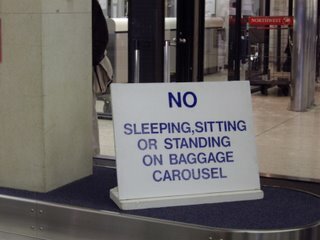 Who the h*#@ sleeps on the baggage carousel? How restful could that possibly be? I can see the appeal of sitting or standing if you're 5, but that's about it. 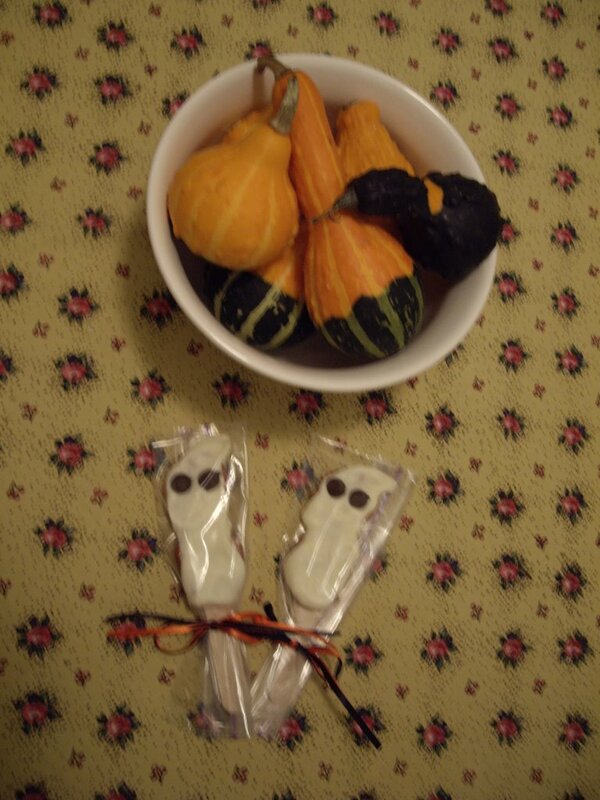 My friend gave me these darling almond bark/pretzel ghosts. So cute and clever! 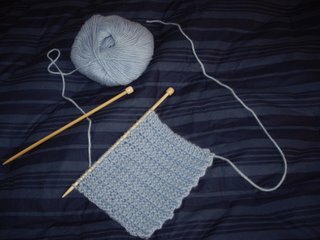 I finally learned how to use DPNs properly at knitting group last night. Mittens, hats, SOCKS, here I come. Check out this post by Scott Adams, the creator of Dilbert. Hat tip to my husband, Paul. I've seen this meme all over the place, so here's another. 3. WHEN DID YOU LAST CRY? I can't make it through a movie (or a fight) without crying. I cried while watching The Horse Whisperer last Sat. night. Hey, the movie was my parents' choice. 4. DO YOU LIKE YOUR HANDWRITING? Yes, it's neat and easy to read. 6. IF YOU WERE ANOTHER PERSON WOULD YOU BE FRIENDS WITH YOU? I certainly hope so! 7. DO YOU HAVE A JOURNAL? Just a blog. 9. WOULD YOU BUNGEE JUMP? No way, I'm afraid of heights. 11. DO YOU UNTIE YOUR SHOES WHEN YOU TAKE THEM OFF? Yes, but I wear clogs and sandals as much as possible, so it's not always an issue. 12. DO YOU THINK YOU ARE STRONG? I'm one tough broad. On a more serious note, I am strong emotionally and surprisingly strong physically as well. 15. RED OR PINK? Red! Either dark red or bright UW Badgers red. 16. WHAT IS THE LEAST FAVORITE THING ABOUT YOURSELF? I have a hard time with my weight. 17. WHO DO YOU MISS THE MOST? I'm not sure. 18. DO YOU WANT EVERYONE TO SEND THIS BACK TO YOU? Not unless they feel like it. 19. WHAT COLOR PANTS, SHIRT AND SHOES ARE YOU WEARING? Black microfleece yoga pants (best Old Navy product ever! ), black microfleece pullover, and black and grey striped socks. No shoes for me! 20. LAST THING YOU ATE? A little Mexican fiesta that I cooked up for dinner. Bean and chicken enchiladas, roasted corn and bell pepper salad, tortilla chips with guacamole and salsa, and margaritas. 21. WHAT ARE YOU LISTENING TO RIGHT NOW? An old compilation CD -- MTV 120 Minutes Never Mind the Mainstream (Vol. 1). The current song is fabulous -- "Ana Ng" by They Might Be Giants. 23. FAVORITE SMELL? Right now it's the White Barn Candle Company "Creamy Nutmeg" candle that's burning right next to me. Usually it's the smell of clean sheets! 24. WHO WAS THE LAST PERSON YOU TALKED TO ON THE PHONE? My best friend. 25. THE FIRST THING YOU NOTICE ABOUT PEOPLE YOU ARE ATTRACTED TO? Eyes! And smiles. 26. DO YOU LIKE THE PERSON you stole THIS from? Well, I saw many knitbloggers doing this one. 28. FAVORITE SPORT? Sports? Me? I think not. On second thought, I take that back. I love to ice skate. 31. DO YOU WEAR CONTACTS? about half the time. 33. SCARY MOVIES OR HAPPY ENDINGS? Happy endings. I'm a sucker for Sixteen Candles. 35. 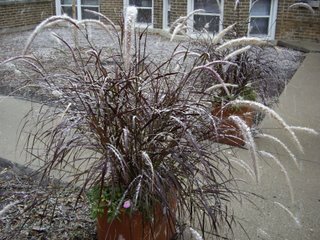 SUMMER OR WINTER? Winter all the way! 42. WHAT DID YOU WATCH LAST NIGHT ON TV? Antiques Roadshow. Once again, please bear in mind that I was visiting my parents. I actually saw part of the Lawrence Welk Show with them on Saturday. 43. FAVORITE SOUNDS? Kylie Cat snoring. 44. ROLLING STONES OR BEATLES? Beatles! 48. WHO SENT THIS TO YOU? Stolen from the knitblogging community, Karin in particular. 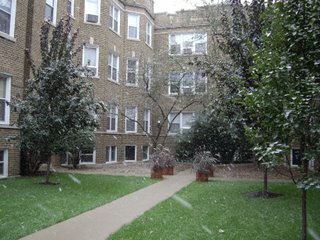 "New School Knitting," composed of about 35 pieces, plus a selection of videos and other materials, will run through Sunday, Dec. 17, in the School of Human Ecology's Gallery of Design on Linden Drive. Swansen will attend the opening reception at 1 p.m. on Sunday, Oct. 29, at the gallery. Greenfield will speak at 2 p.m., followed by a question-and-answer session with Swansen. Knitters will be welcome for drop-in sessions starting at 7 p.m. on Thursdays, Nov. 2, 9 and 16 in the gallery. 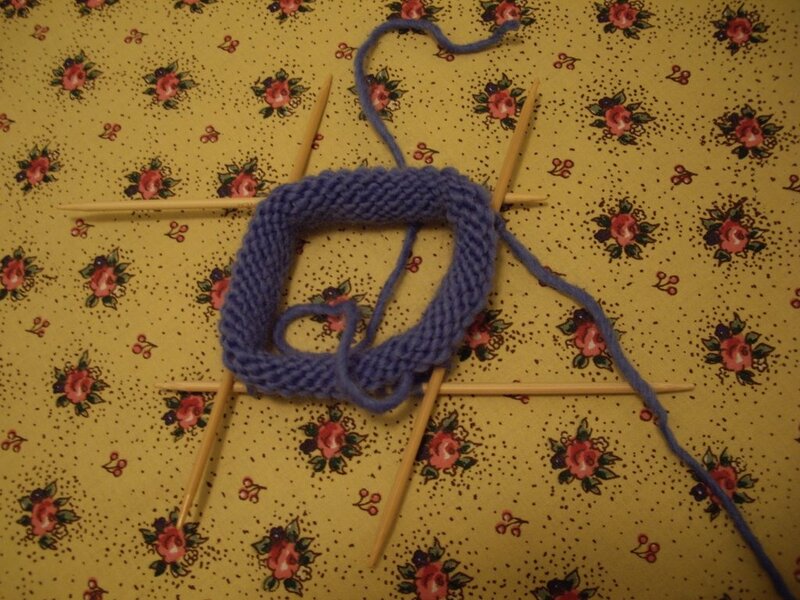 Plans for a weekend knitting workshop also are in progress. All events are free and open to the public. For more information, or call (608) 262-8815. Sounds like it's time to make a trek back to my alma mater. My plan was to knit up a swatch of my newly-acquired Plymouth Suri Merino, an absolutely lovely alpaca/wool blend that puts the Knitpicks Andean Silk to shame. Lo and behold, I now have another scarf on the needles. 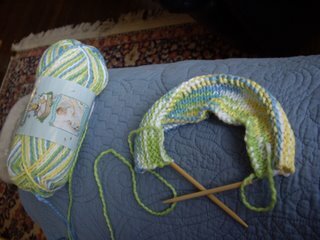 There should be plenty of yarn to make one of Grumperina's Odessa hats as well. Minus the beads, of course. I absolutely love this easy, reversible stitch pattern. Just one row to remember! This is a blessing after the mess I made of my lattice scarf while watching The Horse Whisperer on Saturday night. Messing up on a bias knit scarf resulted in a very funky shape, much to my dismay. The movie was far better than I expected, though fairly predictable. The real star of the movie was Big Sky Country -- Montana. The cinematography was fabulous, and I longed for mountains and open spaces while I watched. My mother is doing far better physically than I had anticipated. She actually has been cooking up wonderful meals for me in an exact role-reversal of what I envisioned. I did bake my dad a carrot cake for his birthday, though, when Mom needed a rest. We did some thrifting yesterday and found a few goodies that, alas, cannot be mentioned publicly. 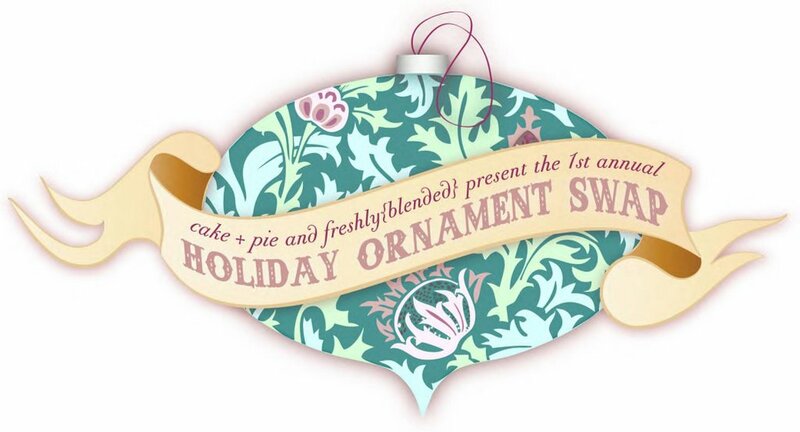 I joined the Holiday Ornament Swap, and I'm already planning my contributions. Maybe little knitted mittens or stockings? Or embroidered felt birds a la last year's Anthropologie catalog? I would love to find a pattern for knitted (*not crocheted*) ice skate ornaments. You know, those cute ones that use paper clips as blades. I have a yellow pair (with bright pink pompoms) that my grandmother made in about 1960 or so. The Sienna Cardigan from the fall 2006 issue of Interweave Knits has also piqued my interest. Not in orange, but maybe in a lovely shade of blue Malabrigo. Heather (at All Things Heather, 10/1/06 post -- I can't get the link to work) knit a beautiful Sienna in Jaeger Shetland Aran. I just happen to have an abundance of navy Jaeger Shetland Aran, and this might be a great opportunity to use it. 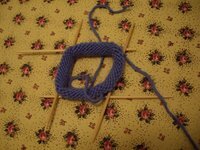 In other knitting news, frogging Andean Silk isn't all that fun. It gets a little fuzzy and icky. Not my favorite yarn, but I like it better than most acrylic blends. Inspired by the other night's successful Rachael Ray meal, I chose the very next recipe on the page: Seaman's Potpie. Awful name, awful recipe. Gluey consistency due to excessive cornstarch, very little flavor, terrible aroma, and very expensive to make. The name alone should have warned me away! Which of the 50 United States have I visited? This may help with trip planning! Apparently I have neglected the Pacific Northwest and New England. Sorry, the southwest and the south are both just too darn hot for a winter-loving Minnesota native like me. check out these Google Hacks. - I added 1 extra carrot (adding 2 extra carrots would be fine, too). I love to sneak more vegetables into recipes like this. - I used lean ground chicken breast. - I cut down on the butter and olive oil. - I added a 15-oz. can of cannellini beans, with some (but not all) of the liquid drained off. This was a huge improvement over the original recipe. - I crumbled blue cheese over the top of the chili and skipped making the blue-cheese corn pancakes. I served sourdough bread instead. The Nantucket Jacket -- very classy. I like its lines and shaping; however, I fear that the presence of so many cables may look too bulky on anyone who's not a size 4 (i.e., me). A cardigan for Arwen -- more my style, but awfully short. I like the cable details, as opposed to the allover cables. BTW, the pumpkin knit up very quickly. 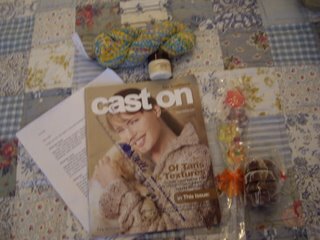 All I need to do is make a trip to Joann for some stuffing and knit up a little green stem to attach. 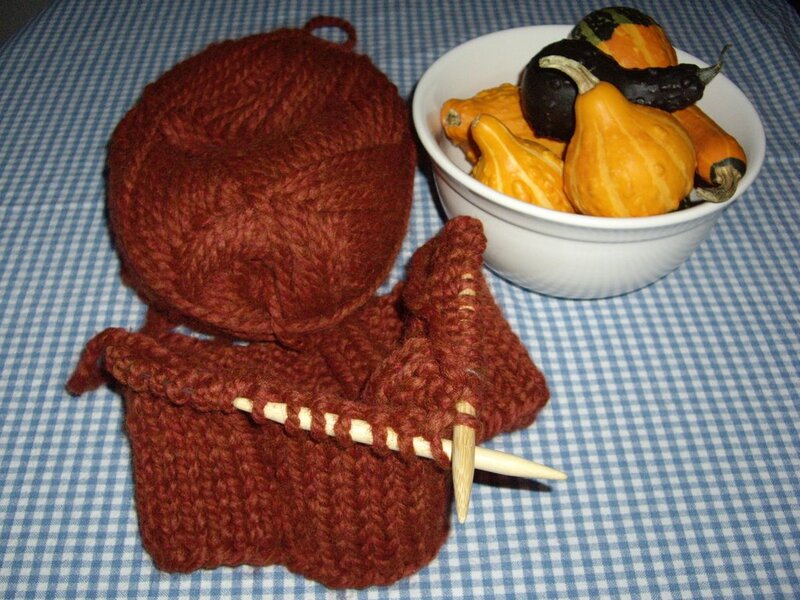 I dug into the stash and pulled out a skein of chunky orange yarn to knit up a cute pumpkin in honor of autumn. This is going to be a quick knit! I had forgotten how quickly bulky yarn knits up. 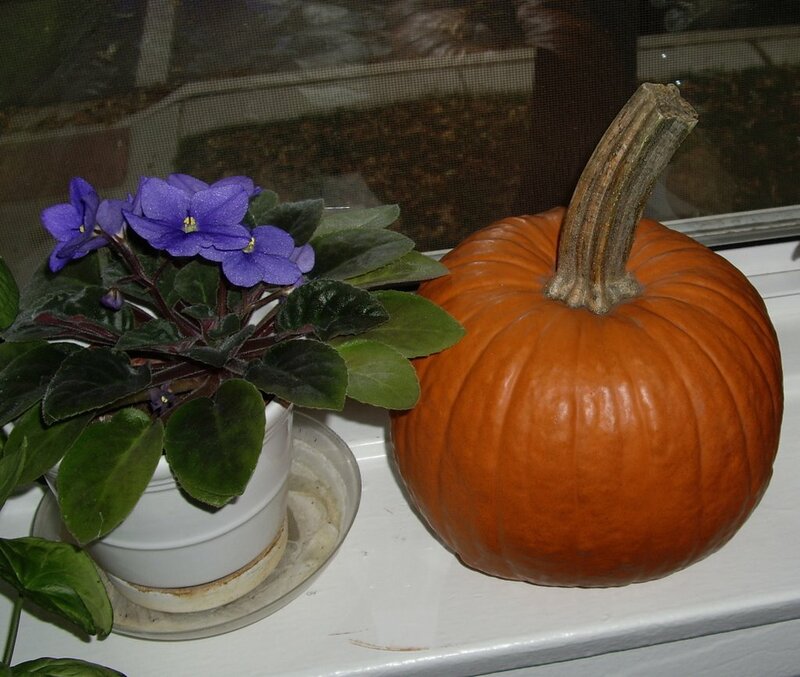 Here are a couple finished pumpkins on display. 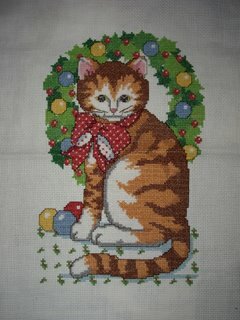 I found the pattern online on a yarn store webpage, but I haven't been able to retrace my steps. I took a trip out of the city on Friday afternoon to an apple orchard and pumpkin patch in Indiana. Here are some of the fruits of my trip. I picked up plenty of apples, cider, and cider donuts, too. Yum! I added fringe to my noro scarf for the ISE, and it looks great. It just needs a steam block, then it's winging its away across the country. 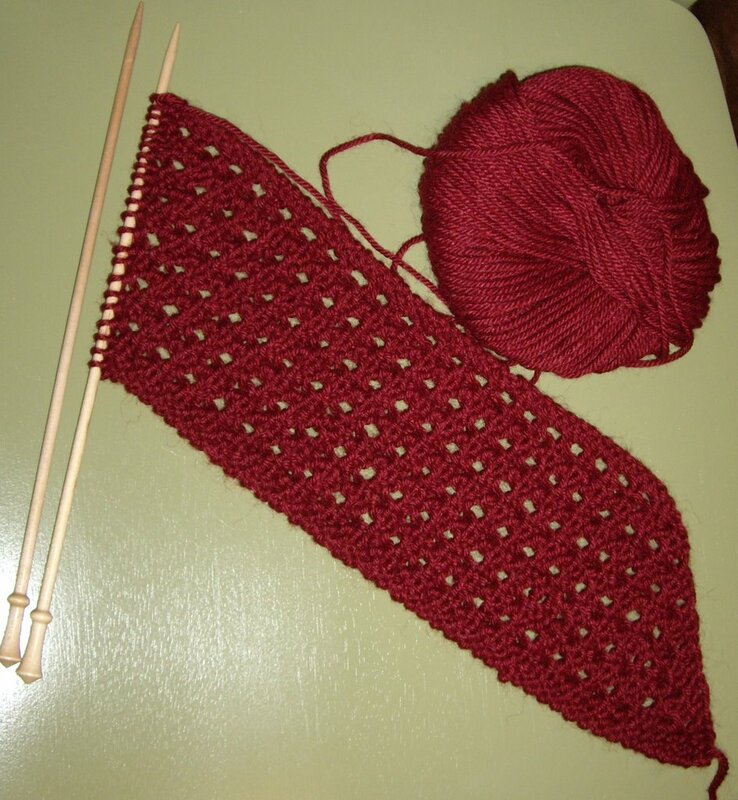 I also added another two feet to my red lattice scarf. My mother was in the hospital last week, and I'm planning a trip to Minneapolis for the upcoming weekend to cheer her up and help out my dad. 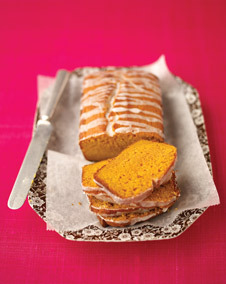 I'm gathering up hearty, healthy recipes so I can cook them some meals while I'm there. Hopefully I can freeze them a supply of dinners. This is a bit of a challenge for me, since I don't eat red meat and I love spicy food. They eat plenty of red meat (and pork) and they can't take anything too spicy. and select a couple movies. You can tell it's getting colder around here. The cats are getting fluffier and snugglier, just how I like them. This time it's a lattice scarf. I was inspired by this one over at Tea and Cakes. I have 3 skeins of yarn, so we'll see how long it gets. It's a pretty skinny scarf, so it might be very long. I think it will look great up against my charcoal wool coat. At first I didn't like the feel of the Andean Silk. It seemed pretty solid, and it doesn't have much give or spring. I'm growing to like it over time, though. Too squishy a yarn would just stretch out with wear. Susah H. sent me two wonderful packages for the Knitters Tea Swap. They both arrived on my doorstep on Tuesday. What a lovely surprise after a long day on campus! All I can say is that Susan has exquisite taste. A sampler of 6 flavored black teas from Adagio, Susan's favorite tea source. I'm drinking the cinnamon tea as I type, and it's delicious! 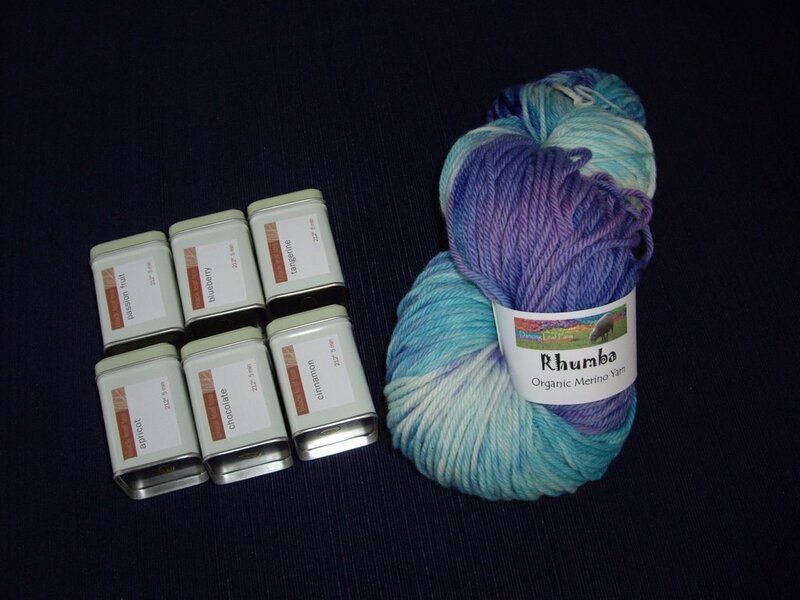 The beautiful handpainted yarn is "Rhumba" from Dancing Leaf Farm. 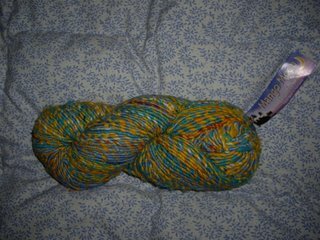 Not only are the colors wonderful, the yarn itself has a great hand and there's a ton of yardage (300+). And it's organic merino wool! I think it's the perfect yarn. Maybe mittens and a hat? Also from Adagio is this clever infuser mug. Not only is it cool and mod looking, it has a lid to keep tea hot while it steeps. The mesh infuser doesn't leak tea leaves like my old mesh infuser spoons do. Plus the whole thing is dishwasher-safe! What could be better? Susan has also simplified my birthday and Christmas shopping this year. I'm going to buy a bunch of these great infuser mugs as presents for all the tea-drinkers I know. My parents' visit went well. They gave my apt. the "Good Housekeeping seal of approval," so I guess all the frantic last-minute cleaning was worth it. We went to the Lincoln Park Conservatory and Zoo, which they loved. I also took them on their first trip to Trader Joe's. It was packed since it was a Sat. afternoon, but they still enjoyed it. Chopped apples – crisp and tart apples are best. I prefer Granny Smith and Haralson, a variety developed at the University of Minnesota. Chopped walnuts – Trader Joe’s new candied walnuts are fabulous, but plain/toasted work well, too. - raspberry preserves or jam. I use Malkin’s raspberry jam, which comes in a can and is hard to find outside of Minnesota and Canada, but I’m sure that just about any good quality raspberry preserves would do. I add a little bit of pepper to the mixture, and I shake it up well. Combine salad ingredients and dressing and toss. Here's proof that some of my knitting needles actually do have a good home! Wow... this is quite the questionnaire. There's a lot of detail in here! I like natural fibers (esp. merino wool) as well as interesting blends. I love Malabrigo – it’s such a soft and cozy wool yarn. I like Lorna’s Laces in general, especially the superwash and the oh-so-luxurious Lion and Lamb (50% silk / 50% wool). Alpaca is great, especially when blended with wool. Silk/wool blends are another favorite. Like many knitters, I’m not into boucle, fun fur, or acrylic, although acrylic has its place, especially when I’m knitting for babies and busy moms. I'm not a big fan of mohair or anything too scratchy. 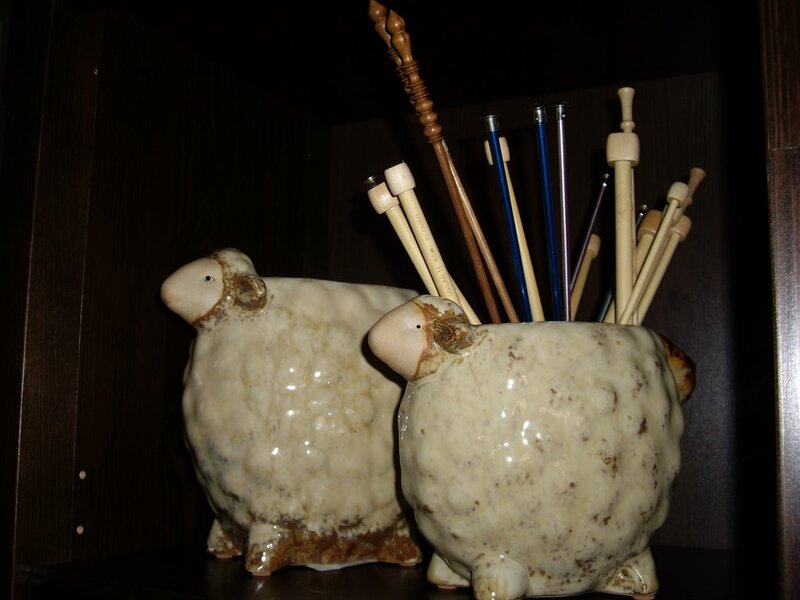 A few needles are displayed in a cute sheep pottery vase in a bookcase in my living room. The rest live in an old cardboard box. I’m embarrassed to admit it. I have been knitting for almost a year. I’m an advanced beginner. Yes, I have an Amazon list. See here. 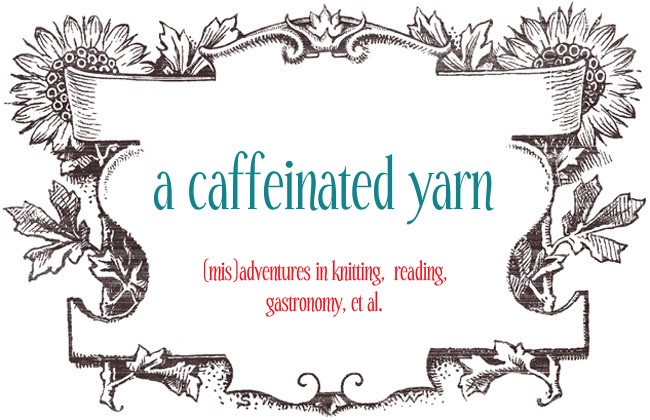 It includes plenty of non-knitting content, so be forewarned! I love lavender and vanilla combos (but not lavender separately, except for that horribly expensive but marvelous lavender hand lotion from L’Occitane). I like fairly natural scents – coconut lime verbena, mint, almond, lemon, citrus, nut. I’m a sucker for lovely handmade all-natural soaps, especially ones made with oatmeal, honey, goat’s milk, etc. I like milk-scented body products (like the Body Shop’s, or the Au Lait brand sold at Target). I often burn candles in my study while I work, since the study doubles as the cats’ room and the litter box is in there. Stinky! All the above scents are great, and I also like pumpkin/cranberry/cinnamon/nutmeg type candles in the fall and winter. Soy candles are super neat! Yes! Dark chocolate is a favorite, and I also like chocolate combined with hazelnuts and Milka brand milk chocolate. I’m also into scones, lemon curd, shortbread, and Pepperidge Farm cookies. I’m not too big on fruity or gummy candies. I love to bake, but I try to keep it under control. I’m trying to watch what I eat, so a few treats are great, but my waistline doesn’t need an abundance of sweets. I love flavored coffee and tea (esp. fruity or spicy black and fruity green tea). Other healthy options are granola and dried fruit. 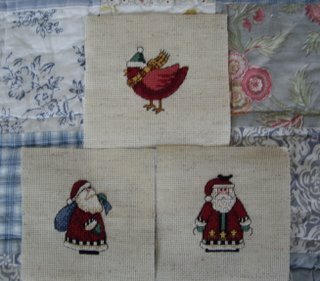 Quilting, cross-stitching, embroidering. No spinning for me! I am a bit of an audiophile. CDs and MP3s work for me. I like indie rock, alternative rock, 80s pop, classical piano, and Brazilian music. No rap, R&B, hip-hop, or country (except for the Nitty Gritty Dirt Band!). My favorite artists include Belle and Sebastian, Snow Patrol, REM, Reindeer Section, David Bowie, U2, Pet Shop Boys, the Smiths, the Decemberists, and Death Cab for Cutie. In terms of classical composers, I appreciate Rachmaninoff, Chopin, and Liszt. I would love to add more Mozart and Beethoven to my music collection. Blue is my absolute favorite color! Dark blue, light blue, navy… it’s all good. I also like plum, dark red, sage green, lavender , and neutrals like black, grey, and cream. I’m not too into yellow, orange, or olive or forest green. 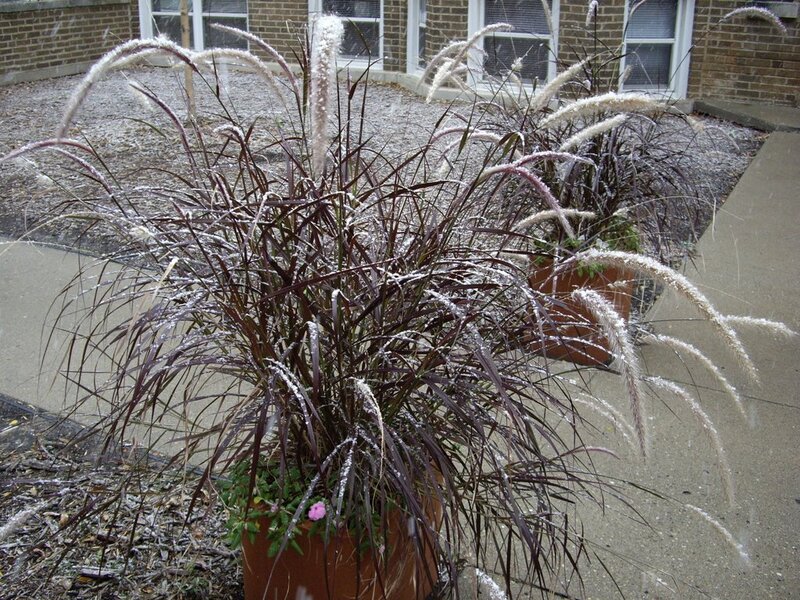 I like solid, heather, and variegated colors. I am married with no kids. 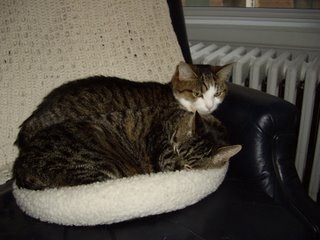 I have two cats, Kylie and Capricha. They are 10-year old domestic shorthairs, and they love catnip! They tend to be strangely picky about cat treats. Scarves, hats, and mittens – yes! I live in a cold climate, and I love winter. No ponchos for me. Baby sweaters and blankets, scarves, and mittens. I also like making bags. They all have their uses. I prefer bamboo or wood, but I use others, too. I’m not very religious, but Christmas is still my favorite! I love cold weather, snow, ice skating, sledding, skiing, baking, spending time with family and friends, and relaxing. I also like all the bunnies, tulips, and spring weather associated with Easter. Books! I’m a voracious reader. I collect mugs and tins with British themes. 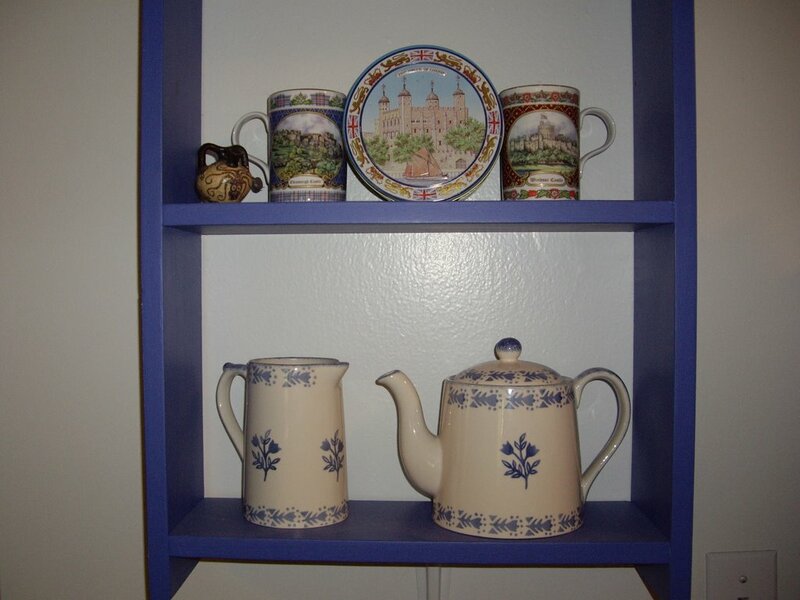 I also like patterned blue Polish pottery mugs. There are a couple basic knitting books that would be great additions to my knitting library: Elizabeth Zimmermann's Knitter's Almanac and Ann Budd's Handy Book of Patterns. I'm dying to knit the mitred mittens in the EZ book. I saw a gorgeous pair made of Noro! There are some more knitting books on my Amazon list (Greetings from Knit Café, Natural Knits for Babies and Moms: Beautiful Designs Using Organic Yarns, Knitting on the Road). I want to start knitting socks. I have the book Sensational Knitted Socks (which seems a little overwhelming with all the charts), but if there’s a great basic super-easy sock pattern out there, that would be perfect for me. I use Debbie Bliss patterns for baby sweaters, but I’ve never used her yarn. It would be nice to try that. I would love to try knitting with a soy-blend yarn like Rowan’s Tapestry or Paton’s Soy Wool Stripes. I subscribe to Interweave Knits. I want to learn to knit socks! 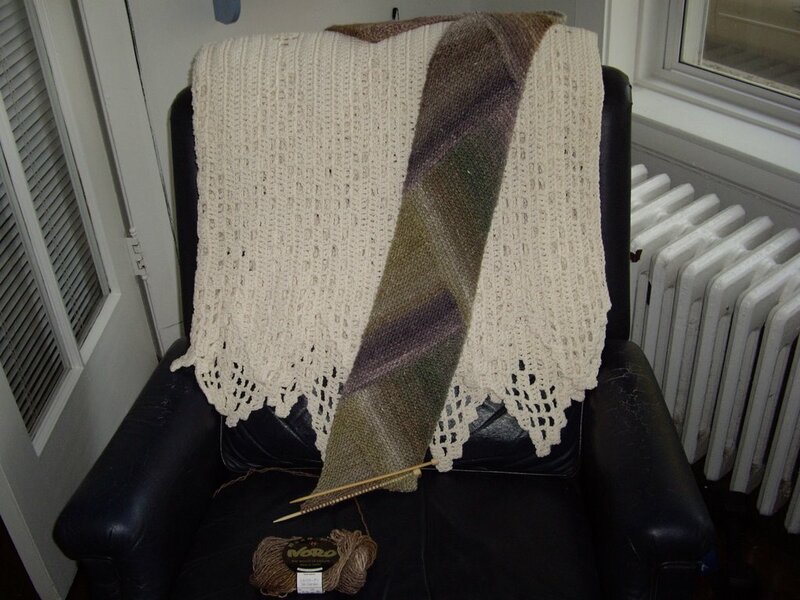 I also want to try cables – I’m planning the Irish Hiking Scarf as a first cable project. I already picked up some Clover cable needles. I love the look of Fair Isle. I should probably start with something easy, but I’m dying to knit the Squirrelly Swedish Mittens from Elliphantom’s website. I don’t have any teeny tiny needles (no straights below a 5, and no DPNs below a 4). Not yet, but soon enough! I wear a US 9. I have been busy organizing, though! My parents are coming to town for the weekend, and it has spurred a cleaning and organizing frenzy. 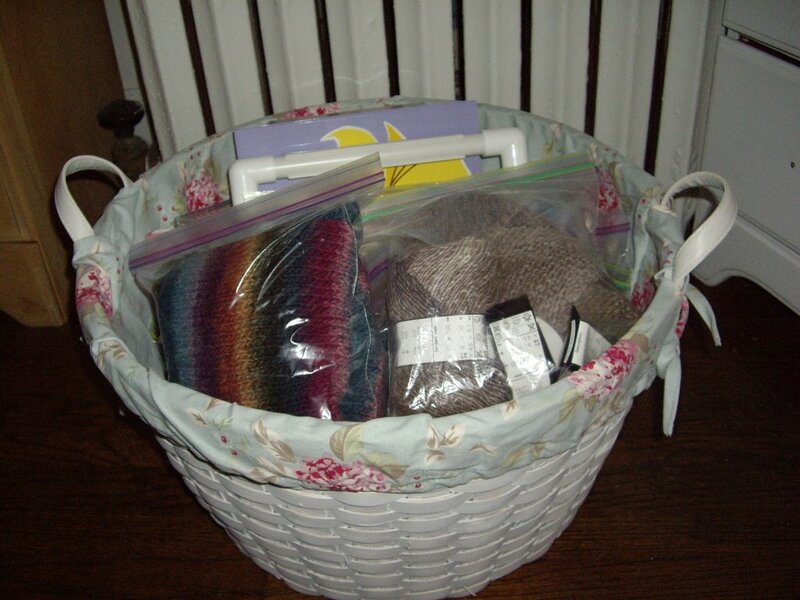 I reorganized my WIP basket. I feel a bit like I'm keeping the Ziplock folks in business! I want to make a whole bunch of simple drawstring project bags for the basket in coordinating floral prints. I found this basket at Ye Olde Target a month ago, and they just added bed linens in the same floral pattern. My father built this shelf for me. I keep part of my mini-collection of Great Britain-themed mugs and tins on it (only half the shelf is in this picture). 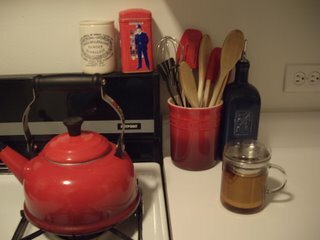 I'm "flashing" my favorite teapot. 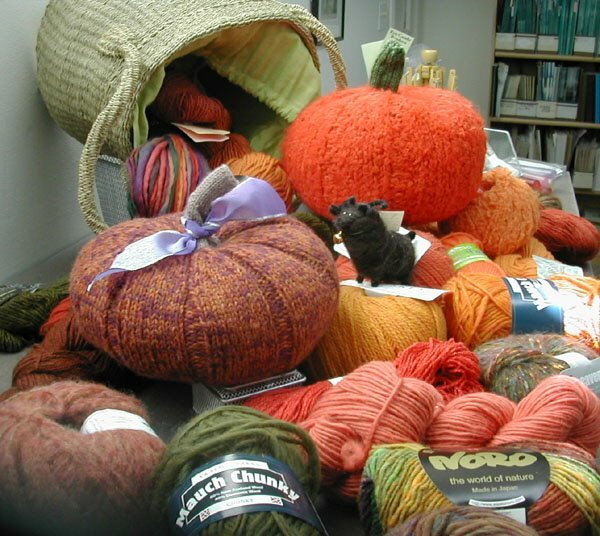 Major Knitter is embarking on a project to teach kids how to knit, and it's for charity. She's collecting chunky/bulky yarn and size 10 and 15 knitting needles. I'm going to rummage through my stash for some likely candidates. The Lorelei Tank Top is absolutely gorgeous, and I think I could wear it over a tailored white shirt this winter. Plus the pattern calls for Noro! Another highlight is the k.i.s.s. (keep-it-simple-so-your-man-will-wear-it sweater) -- very classy, and I think my husband actually would wear it. It's a little bit J. Crew and a little bit funky. 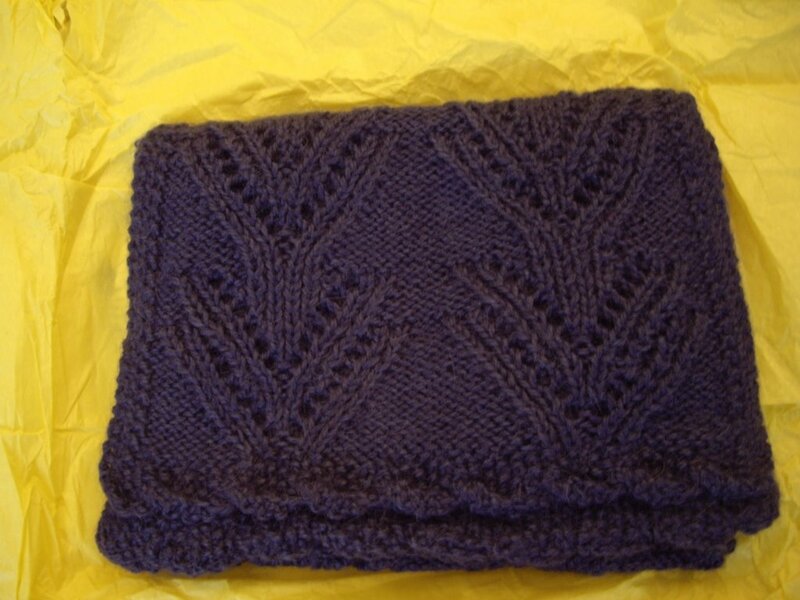 The Manta Ray shawl is lovely, and it would be a great beginning lace project for me. What have I learned from my first swap? I need to kick it up a notch! 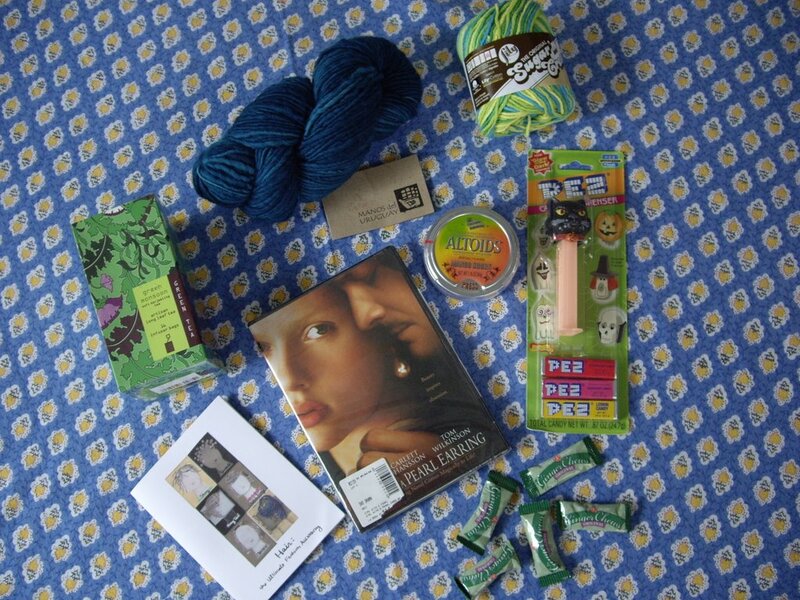 I'm afraid that the package I sent Bekka doesn't even begin to compete, but I certainly put thought into each item. 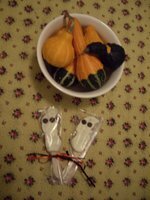 One of the wonderful things that I've discovered since I started knitting last fall is that knitters are very generous and thoughtful people. The Noro scarf is coming along nicely. I did some good work on it over the past couple nights while watching DVDs -- a couple episodes from Season 3 of Buffy as well as the movie Shopgirl. Claire Danes played a poignant Mirabelle, and the movie was surprisingly good and very thoughtful. I was prepared to be turned off by the Steve Martin/Claire Danes relationship (remember that awful Winona Ryder/Richard Gere pairing a few years ago? ), but it was touching and well done. I loved the scene where Ray sits on the futon in Mirabelle's apartment. Also, the cat interfering in the action during a love scene was awfully humorous. Here are the beginnings of a Mason-Dixon baby kimono, balanced on the arm of my couch. I may frog this and go with garter stitch instead since this curls up so much. I'll have to look at some finished versions to see how it turns out in stockinette. King’s mysteries featuring Mary Russell and Sherlock Holmes are far more thoughtful than most of the mystery schlock out there. Mary not only solves crimes (not the most interesting part of the novel – I’ve read two Mary Russell novels now and the mystery aspect is neither terribly exciting nor very innovative), but she also ponders feminism, religion, mysticism, and the nature of love, all in a very engaging setting. The characters are well-drawn, flaws and all. I suspect that King has been influenced heavily by Dorothy Sayers, whose Gaudy Night lurks in the background of this novel. A light-hearted read, somewhat like Philip Pullman’s His Dark Materials trilogy and the Harry Potter books, but not as engaging as either series. Funke published this in German, and I read the English translation, which may have marred the experience. A young girl discovers that her father can read characters (and creatures) out of books, just by the sheer power of his voice. She also learns about the consequences of this gift, or should I say curse. Fine, but nothing special, aside from Funke’s enchantment with books and promotion of bibliophily. I must admit that the author’s name drew me in! I immediately thought of Tobias Funke on Arrested Development. Plus I wanted something light to read in a busy airport. As I read this book, I realized that it seemed awfully familiar – I saw a movie adaptation a few years ago. This is also a light read. Four British women come to Italy to escape their family and friends; they rent a villa for the month of April, and it changes their lives. Despite being fluff in many ways, this novel has a great strength. Von Arnim effortlessly shifts and slides into the different character’s consciousnesses. Von Arnim’s not afraid to voice the selfish and irrational thoughts that people harbor, and it seems quite genuine. More on Michael Chabon’s Wonder Boys and Anya Seton’s Katherine soon. The first week back at school is always a little rough. Exhilerating, but rough. I have a busy plate this quarter, but keeping busy helps me stay on top of things. With schoolwork, that is -- maybe not with the knitting, though. I emerged from piles of books and papers to head to one of my favorite Chicago yarn stores, Loopy Yarns, to stock up on some supplies, namely lots of knitting needles. I couldn't resist a gorgeous skein of Lorna's Laces Lion and Lamb, a 50% wool / 50% silk blend that is just luscious. I ended up choosing the colorway Tuscany, in honor of my recent trip. It was a tough selection, since many of the yarns are named after Chicago neighborhoods, and I really liked the Lakeview colorway (my neighborhood). Another time, I'm sure. 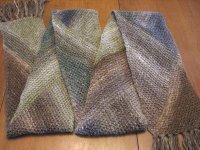 I have been knitting away at the Silk Garden scarf. I added the third ball of yarn today. I have decided that fringe is definitely the way to go this time!